Before Creative Technologies created the Sound Blaster ROAR, there was the Creative AXX series. The latest AXX200 wowed the portable wireless audio industry with a bag full of features equivalent to a swiss-army knife. There are so many features that I better list them down here in case I miss out any of them. The price? A promo price of S$199! The AXX200 is a hexagonal cylinder stand with a slopped top. I quite like that it’s not round like UE Boom so that I can actually lie it to the side without rolling around. The speaker is protected by metal grille while the rear is furnished with glossy plastic. 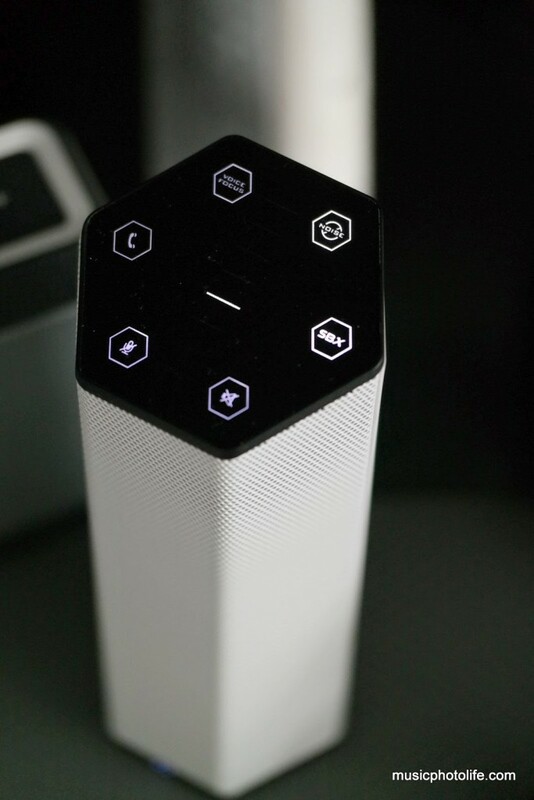 Controlling the speaker is via the top panel which is touch-enabled with lighted icon displays. The rear panel is covered with hardware buttons, port tube, microSD card slot, USB port, audio jacks. The main microphone is at the top. Wireless pairing is made easy with NFC, and at the lower speaker panel, you can spot a 3-LED battery indicator. The primary purpose of getting a portable speaker like AXX200 is the speaker function, so let me cover this first. For most of the Bluetooth speakers in the market, you would have been constrained by whatever sound quality the hardware delivers. For the AXX200, what you hear is not what you only can get. 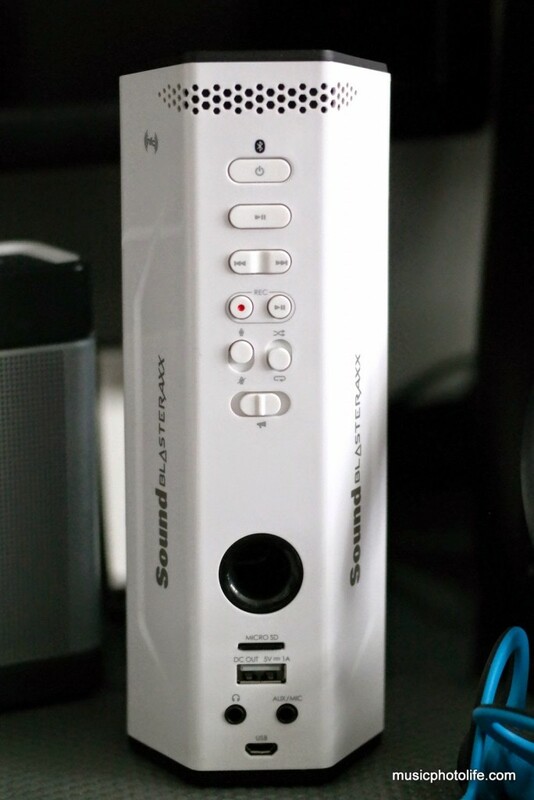 The audio is driven by SBX Pro Studio: when the audio processor is disabled, the speaker produces sound devoid of bass. Once SBX is enabled, you get a more pompous kick bass, and boost in volume. For modern genre music, treble quality is clear and not overly crisp. Music comes out clear without audible wireless compression or distortion. When playing classical piano genre music, I enjoy the overall warm sound. You won’t be able to get the awesomely natural subwoofer like the Bose Soundlink series, as the AXX200 audio balance is more towards treble. You can really feel the AXX200 is trying its best to force out some low registers, and it is certainly better than a lot of portable speakers at this price range. The magic comes when you manipulate the AXX200 using Windows or smartphone apps. For this review, I used an Android OS. 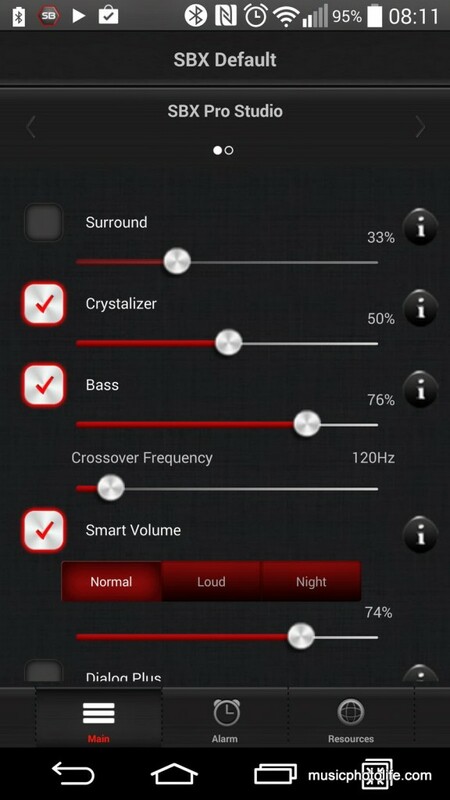 With the Sound Blaster Central app, you can adjust the audio output and make full use of the SB Axx-1 hardware audio processor. With it, I am able to tweak the output to suit my listening preference. I personally like to turn off “Surround” mode to get a tighter sound, and boost the bass level to balance the treble, though it still will not give you the satisfying oomph. Naturally, the app comes with preset audio profiles for music, movies, and gaming, to save you the hassle of manually adjusting the sound quality. The AXX200 also comes with CrystalVoice voice-enhancing profiles that you can use for your teleconferencing purposes. My family had a fun time messing up with our voices with Voice FX function, which morphes our voices almost instantly. 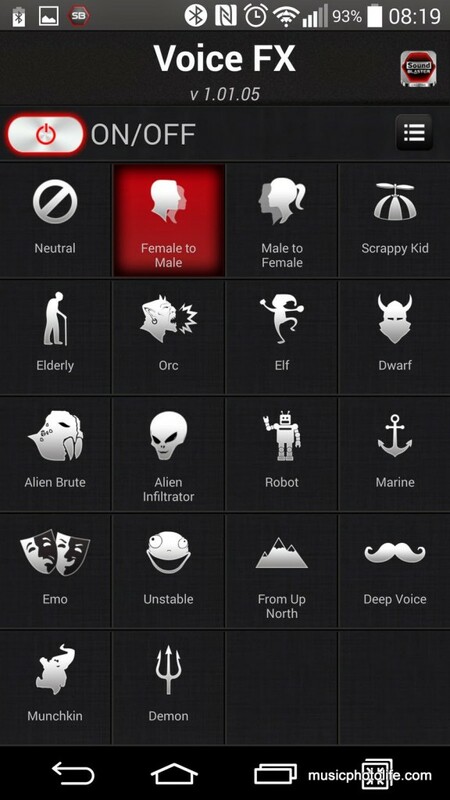 On the AXX200, you can choose 8 FX, and via a smartphone app SB Voice FX, you can select another 9. There is a noticeable lag when speaking through the microphone. 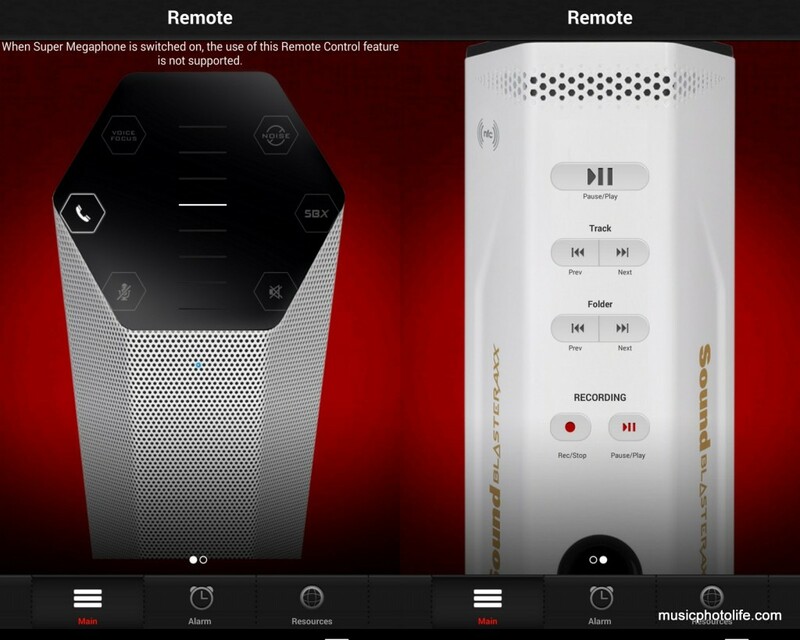 The best feature of the app is that you can control the AXX200 remotely. Every single button on the AXX200 can be remotely controlled via the app, so I can adjust the AXX200 without ever going near it. This includes all the rear buttons like playback, record, and the top touch buttons like volume, mute. As a speaker, you can enjoy the AXX200 either via Bluetooth or 3.5mm connector. It supports 2 simultaneous Bluetooth connections, so you can stream audio from one device and do tele-conversation on another. As a USB audio device, you can connect the AXX200 via USB to your computer. After detecting the hardware, you can make use of the high-quality audio hardware on the speaker to play audio of your computer. You can also plug in headphones on the AXX200 to enjoy audio privately. If your computer has crappy sound card, the AXX200 will really help. As an MP3 player, just plug a microSD card into the slot and the AXX200 will scan for music files and play them. Seeking songs may be a challenge, so I usually pre-select a list of tracks for playback. As a megaphone, you can amplify your voice during events, or apply Voice FX to alter your voice for fun. As an audio recorder, you can record any audio sound that goes into the AXX200, including microphone, music via Bluetooth or line-in, tele-conversation, or a combination of all, e.g. karaoke. However, the recording is not in CD-quality. As a teleconferencing system, you can hold a group teleconversation and get clear voice and speaker quality. As a portable battery pack, you can charge your 2600mAh device twice. For the AXX200, I am not impressed with the battery indicator. The 3-button indicator is so unnoticeable that you will never realise if the AXX200 is running low on battery. In fact, the device just dies suddenly without any visible or audible warning. The touch volume control is also merciless such that if I were to change the volume level drastically, the output will change instantaneously. It would be nice if the speaker fades up or down, giving me enough time to react to the sudden volume changes. The AXX200 is also not exactly rugged, though the package comes with a cloth bag for travel protection. In my opinion, the star of the AXX200 is actually not just the speaker itself, but the collective functions of a single product. The AXX200 audio quality is within expectations, with clear trebles and hardworking bass. However, there is no other wireless portable speaker that comes with a huge list of premium functions at that insanely affordable price. I do hope the AXX200 sells just as spectacular as the ROAR SR20, because it deserves to be successful. The AXX200 is low-priced not because it is inferior, but because Creative wants all consumers to be able to own quality audio products without paying through the nose. Get the AXX200 from Creative Store at S$199 (usual S$375, while promotion last).